In the history of Estonian music, Eduard Oja has not been a very well-known composer. Most of his works have been unpublished and preserved as manuscripts, staying away from availability for interpreters and listeners for many decades after his death. As Eduard Oja already died at the age of 45, his oeuvre is not very numerous and an important part of his creation have been lost, destroyed in the World War II or even by his own. Some of his best works were destroyed by fire, which broke out in theatre Estonia in bombing of Tallinn on March 9 in 1944. Many of his manuscripts were destroyed in the same year, when a bomb of Soviet aircraft hit Oja’s home in Tartu. During his lifetime, only a few of his works were published. Oja lived in hard and difficult times, besides of the World War II, he went through many severe experiences in his personal life. Despite his creation may show in spots some uneven quality, Eduard Oja was a composer of most personal style of music among Estonian composers at his time. The list of his works includes compositions which may be regarded as real masterpieces of Estonian chamber music and which even in context of today’s music sound still fresh. Besides of being a composer, Eduard Oja was also active as a conductor, music critic and teacher. He was one of the most innovative and most vivid personalities in Estonian musical life at his time. Over the last few decades, Oja’s music has made through a revival: his solo and choir songs have been appearing more frequently in the repertoire of Estonian singers, some of his symphonic works have been once again performed. Initiated by Vardo Rumessen, many piano and chamber music works have been premiered or once again played in public. In occasion of the 100th anniversary of Eduard Oja, a concert with his music was held in Tallinn Town Hall on January 22 in 2005. 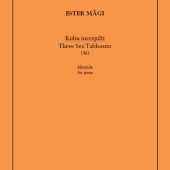 Some of his works (Aelita’s Suite for violin and piano and Trilogy of Time for cello and piano) are once again published. 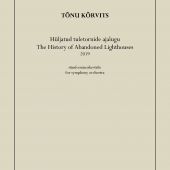 Also a book of his life and works – „Varjus ja valguses” [In Shade and Light], written by Vardo Rumessen, was published in 2007. The book contains among other things also memoirs of composer's daughter Vaike Oja and his friend and colleague, composer Eduard Tubin. 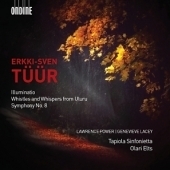 In 2008, a CD with selected chamber music works by Eduard Oja was released. Eduard Oja was born in ranger’s family in 1905 in Palupõhja, Tartu county. From 1919 to 1925, he studied at the Tartu Teachers' Seminar, where by the rules six years of studying were followed by obligatory teaching in an elementary school in any place in Estonia. Following this rule, in the years 1925–1930 Oja worked in Elva primary school. Besides of teaching, he also composed and staged a few song-plays with the pupils. One of his most successful song-plays was "Kullaketrajad" [Gold Spinners] which was attended also by a small orchestra. In early days of teaching, demonstrating his creativity and initiative spirit, Oja compiled a couple of children’s studybooks for music. In 1925, at the age of 20, Eduard Oja started violin studies at the Tartu Higher Music School and in 1927–1932 he additionally studied composition with Prof. Heino Eller. In 1930, Oja moved from Elva to Tartu. Besides of musical studies, he conducted several choirs, among them Mixed Choir of Tartu Music Society and female choir of Tartu Female Singers Society, which under his hand became particularly successful in 1930–1934. To improve local choral singing, Oja published an ear training studybook under pseudonym Oja-Albre in 1930. After the graduation from Tartu Higher Music School, Oja worked some time as music director at the Tartu Drama Theatre. 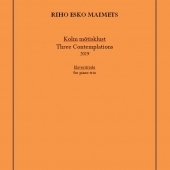 In the period of 1934–1938, he wrote a number of concert reviews for the local newspaper "Postimees" and publicated critics of new compositions, including works by his colleagues Eduard Tubin, Mart Saar and Adolf Vedro, that were published by the Academic Composers’ Union. In 1935, Oja became a teacher of theoretical subjects at the Tartu Higher Music School. From the 1940s, he worked mainly as a freelance composer. In this period he composed a lot of music for stage plays. The most popular became his music for August Kitzberg’s play „Rätsep Õhk” [Air the Tailor]. In 1944, this work like many others of him, was destroyed by fire of theatre Estonia, but Oja managed to reconstruct the music by his memory and with some help by a few actors and musicians. At the end of his life, Oja was living withdrawn from the public life. No new work written after 1948 by him is known. Eduard Oja died in Tallinn on 16th of April 1950. Eduard Oja’s music clearly reflects composer’s controversial nature – on the one hand, playful and funny, fast-flammable, passionate and creative, on the other hand, sad, hopeless and destructive, towards his creations, as well as his person. His mood often fluctuated between sadness and joy, from one extreme to another. He was very sensitive and deeply suffered, when someone showed up unreason or had a negative attitude towards him. Similarly to the conflicting sides of his personality, Oja’s music is filled by varying tempers – engrossed and serious moods often interchange with cheerful energy, humorous and rhythmic characters with melancholy, drama and grotesque. Oja never wrote a work without having lived through it emotionally, he did not believe that a purely theoretical composition could be able to touch a listener's soul. At the time of composing, Oja was very sensitive to his music. After the work was finished, he cooled down and did not care much about its further destiny. Probably for this reason, some of his compositions are lost or even destroyed by his own later. Oja has confessed that he is far from being fully contented with his creation. Sometimes he tried to rework his compositions, but while his creativity rush was by this time abated, his efforts were not always ended up with a better result. Some of his works have been preserved only thanks to his wife Adele Marie, who often made final re-scripts of his scores. He wrote quickly and impulsively, the emotional side of music was for him always more important than the technical side. Many of his works are rather miniature, limited to a few minutes and expressing in most cases only one musical idea or character. Oja often felt himself restless and looked for an escape from reality. His daughter Vaike in her memoirs has written: "My Father had a strong need for beauty, for something different from the usual life. He was very poetic and often longing for an escape above and beyond everyday’s routine, away from life’s ugliness and viciousness. He was constantly seeking for something inaccessible, he was craving for the beauty and harmony." Oja’s idealistic view of life, high aspirations and a tendency to demand too much from himself, as well as economic difficulties and his deepening alcoholism led Oja in the mid 1930s to psychological instability. However, this period was the peak of his creativness, in this decade his Piano Quintet, Silent Moods and a number of solo songs were born. In several of his major instrumental works (Silent Moods, Trilogy of Time, Piano Quintet) Oja has used a scale which consists of alternately-based full and half tone steps. This scale, as he had called it – the Great Gamma – consists of eight separate steps and does not form any minor or major tetrachord. The scale enables to produce a series of chords which in terms of classical harmony can be regarded as random combinations, but as their use in the Great Gamma is correct, they do not conflict in sound with other chords of classical harmony. Such a structure gives to the music a specific soft sound and restless nature, as well as makes possible to create some unconventional melodic lines. Although same type of scale was also used by Alexander Scriabin, Béla Bartók and Olivier Messiaen, it is likely that Oja came to it complete independently. He started to write a theoretical work "The style of the Great Gamma" [„Suurgamma stiil”], but due to lack of time, the work remained unfinished. The most important part of Oja’s music consists of small-scale symphonic works, chamber music and solo and choir songs. In Oja’s solo songs his various moods and emotions are most clearly reflected. From around his twenty songs, the best-known ones are "Põhjamaa lapsed" [Children of the North], "Ööpoeem" [Night Poem] and "Me olime nagu lapsed" [We Were Like Children], created on texts by Estonian poetess Anna Haava and "Sügisemaru" [Autumn Tempest] and "Valge värav" [White Gate], based on poetry by Marie Under. Many songs are written also on Juhan Liiv’s poetry, which Oja highly appreciated. Oja’s music is often compared to the poetry by Juhan Liiv because of their similar poetic and tragic expressions. A special attention in the songs deserve quite demanding and expressive piano parts. 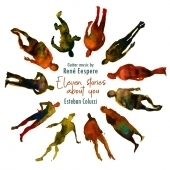 Eduard Oja’s Piano Quintet belongs to the top of Oja’s works as well as the top of Estonian chamber music. This one-movement work in four sections is one of the most extensive, the most formally developed works among Oja’s oeuvre and is also written in the Great Gamma style. In 1935, the Piano Quintet won the First Prize at the Estonian Academic Composers Association’s chamber music contest. Eduard Oja has written about ten small-scale symphonic pieces. His most important orchestral works are „Müsteeriumid” [Mysteries], „Mere laul” [Song of the Sea], „Ööpoeem” [Night Poem], „Ilupoeem” [Poem of Beauty] and Symphony in D minor, written in 1939–1947, called „Nordic Symphony” by the composer. Many of his songs and chamber works like „Aeliita süit” [Aelita’s Suite] and „Ajatriloogia” [Trilogy of Time] have found a way to orchestral music. The piano cycle „Vaikivad meeleolud” [Silent Moods] is known also in an arrangement for string orchestra. 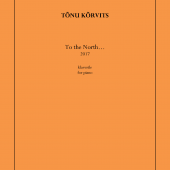 Cantata „Kojuminek” [Going Home] written in 1943, based on poetry about the Finnish Winter War by Marie Under, was known as one of his best works. Unfortunately, the score was destroyed three months after its premiere in bombing of Tallinn by Soviet occupation forces in March 1944. The 30-minutes lasting cantata was composed for male choir, baritone soloist and symphony orchestra, including 7–8 timpani and it was meant to be performed in occasion of the 20th anniversary of the Tartu Male Singers’ Association’s male choir. 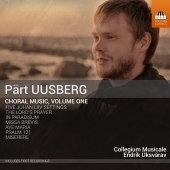 The work was commissioned by Oja’s friend, composer and conductor Eduard Tubin, who at the time was conductor of the choir. Loosing this work was a great loss, many of the listeners had remembered it as an unique experience and were pointing this composition out as biggest successes of Eduard Oja’s creations. Another work of unfortunate destiny was his opera "Lunastatud vanne” [A Redeemed Vow], composed in 1938–1940 for the competition of stage works in occasion to the 75th anniversary of theatre Estonia. Even the opera won 1st Prize in the contest, it has been never staged. Premiere of the opera was suspended because of German occupation in Estonia in 1941. Then, the opera was supposed to be performed in the Art Decade in Moscow, but the performance was cancelled due to the outbreak of war between the Soviet Union and Germany. After the World War II had expanded to Estonia in 1942, it became clear that staging an opera of Estonian Independence War, will not be possible in this political situation, even the new libretto was commissioned from Bernard Kangro. After the end of war, the libretto was given for another rework to Paul Rummo which meant new modifications in opera score once again. For that time Oja was desperate enough to destroy the score by drowning it into the pond of Kadriorg Park in Tallinn. Since the plot of the opera was related to the Estonian Independence War and it was written by Oja in memory of his father’s home that was violently burned off at early childhood of composer, such a misadventure with the opera was for him particularly disappointing and frustrating.